You know your meat. Whether it's venison, quail, fish, pheasant or any wild game, you want it cooked right. After all, you worked so hard to get it. SmokinTex smokers are the perfect final touch to that hard-won meal. You can trust your take to our slow, even heat that infuses your food with delicious, wood-smoked flavor. It gets it right every time. Give the dog your bones from a SmokinTex meal and watch him go crazy. You can even make jerky with your SmokinTex smoker from virtually any meat to savor the flavor as long as possible! Click here for recipes to create some of your favorite meals. And if you're willing to divulge some of your own recipes you've created, we'd love to see and share them! E-mail us at recipes@SmokinTex.com. Whether it's turkey season in the spring or hunting wild hogs and exotics through the summer, let’s concentrate on turning all that game meat in the freezer into some tasty meals! The standard method of preparing venison in Texas has long been chicken fried steaks or, possibly venison wraps with jalapeno and bacon. These tried and true recipes are excellent eating but how about learning a few new ways to put this tasty and nutritious meat to use? I grew up on a farm in northeast Texas and from a very young age, watched my dad cure hams and bacon from domestic hogs we raised. He also devoted a day to ‘sausage making’ and cranked out not only breakfast sausage but smoked links as well. Most of my adult life, I’ve regretted not paying closer attention to the methods he used to create those tasty home cured hams and sausages. I’ve been making breakfast sausage and smoked links for many years, thanks to some hands on instruction from my friend Ashley Gorman, who comes from a long line of German butchers and sausage makers. GETTING STARTED- Breakfast of ‘pan’ sausage is the easiest of the sausages to make. All that’s needed is ground meat and seasonings. I much prefer to use pre mixed seasonings rather than buying all the spices in bulk and mixing them myself. For a few dollars, one can order enough of the seasonings to make 25 pounds of sausage. Some of the mixes contain more ‘hot’ in the form of red pepper others, more sage. It’s fun to experiment with the different mixes until you discover which best suites your taste. Exact rations of pork to venison can also vary to suit your taste. If you prefer a very lean sausage, a blend of 75% venison to 25% pork might be best. I’ve also made many pounds of breakfast sausage from quality cuts of wild pork. If you have a meat grinder, you can grind the meat at home, if not, your game processor can do the task for you and supply you with 1 or 2 pound packages of ground meat. In a large mixing bowl, I blend the prepared spice packet with the ground meat then wrap in one pound packages and freeze until needed. It’s a good idea to ‘test’ fry a sausage patty after adding some of the seasonings. Remember, you can always make your sausage more spicy by adding more seasoning but once added, you can’t take it out! ON TO SMOKED SAUSAGE- Next time you’re at the grocery, check the price of specialty sausages such as Kobasa or Bratwurst. You can crank out sausage just as good, or better, at home. You’ll need a sausage stuffer (funnel) for your meat grinder when making the smaller links and some way of slow smoking the meat once it’s in the casings. When slow smoking at low temperatures, you will need to use a cure with your seasonings, it’s usually included with the seasoning packets. It’s best to mix the seasonings/cure with the ground meat the day before you plan to stuff the sausage into casings and place it in the refrigerator. This gives the meat time to absorb the cure and become well flavored with the seasonings. Like breakfast seasonings, these seasonings come pre packaged, usually one packet makes 25 pounds of sausage but instructions are on each packet. 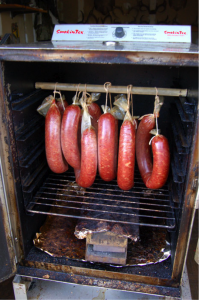 I use a SmokinTex electric smoker for all my sausage making. I simply put the wood pieces in the smoke box, set the thermostat at the desired temperature, and let my sausages slow smoke. I begin at around 140 degrees, the increase the heat slowly until the meat reaches an internal temperature of 160 degrees. Usually after five or six hours at low heat, I increase the heat to 180 degrees for an hour to make sure the meat is at, or just above 160 degrees. Wood fired smokers work just fine for smoking sausage, they just require a lot more attention than the electric models to keep the temperature right. Once your sausage is removed from the smoker, it must be ‘bloomed’ or sprayed with cold water. This helps to avoid air bubbles between the outside of the sausage and the casing it’s stuffed in. If you don’t want to worry with stuffing the smaller links, purchase a few larger casings (the size baloney comes in) and stuff the meat by hand into the large casings. These larger pieces of sausage will have the same great flavor but require a bit longer on the smoker to reach 160 degrees. I usually make several sticks of baloney and chopped ham (seasonings are available at Frisco Spices), then cut the ‘lunch meat’ into one pound pieces and freeze; they come in handy while on the water during summer fishing trips! CURING HAM- I was intimidated by the thought of curing ham at home for years but found the task easy to do, actually much easier than making sausage. Rather than cure whole hams, I cut the ham and backstraps of wild hogs into 2 to 3 pound pieces. Simply rub the appropriate amount of cure on each piece, add some brown sugar and place in zip lock bags in the refrigerator to cure. A 2 pound piece of ham meat needs to cure 3 days; likewise a 3 pound should cure 4 days. I often let them cure 5 days with good results. Make sure and use only the amount of cure recommended for the size piece of ham you’re working with. Too much cure results in a salty tasting finished product. Once the meat is cured, I slow smoke it in my electric smoker eight hours or so, until an internal temperature of 160 degrees is reached. Then, I place the cured, smoked ham pieces back in the refrigerator a couple days and then wrap and freeze until needed. The finished product is excellent. Once you enjoy a big breakfast of ham you cured and smoked, eggs, hashbrowns and biscuits, chances are pretty good you will become ‘hooked’ on curing ham at home! CANNING VENISON- About this time last spring, I canned my first venison. I ordered a jar of the Au Jus paste which is added to each jar of cubed venison before cooking. After the meat is pressure cooked the prescribed time and allowed to cool, the meat is thoroughly preserved and keeps well for well over a year, IF it lasts that long. The canned venison tastes very much like the best roast beef and makes great sandwiches. I’ve even taken the canned venison along on duck hunts this past season and used a portable stove to heat the jar in a pot of water. If you’ve got a pressure cooker, chances are very good it came with instructions for canning meats, if not, the information is available for free from Frisco Spices. The flavorful Au Jus base is key to flavoring the venison which, by nature is very dry. It is recommended to trim all the fat and sinew from the venison and cut the meat into small cubes. Make sure and pack them into the jar tightly; during the pressure cooking process, the meat will settle down into the jar. JERKY- I’ve made jerky from just about everything from ducks and geese to wild pork and it all turned out very tasty. I begin by slicing the meat pieces about a quarter inch thick and marinade it overnight in McCormicks “Grill Mates” seasonings and a little Worchester sauce. The Grill Mates seasoning contains bits of various seasonings that absorb moisture during the marinating process. The trick to tasty jerky is drying the meat pieces rather than actually ‘cooking’ them. Care should be taken not to make the jerky ‘too’ smoky flavored. It requires only a small amount of wood in an electric smoker to impart that ‘just right’ smoke flavor. I usually add only an ounce or two of wood to my electric smoker when preparing jerky. Jerky can also be made in an oven with the door opened slightly to allow the moisture to escape. Liquid smoke can be added to the marinade to add flavor to oven made jerky. Hopefully these tips will help you put some of those tasty wild game cuts to good use. Remember, in a few months, it will be time to hit the woods again and restock! Let me tell you how I make venison fajitas with my SmokinTex. I'll put these up against any beef fajitas I've eaten... anywhere! Begin by slicing venison steak (loin or ham) into finger, fajita size pieces. Make sure and remove all the fat and skin. Place in an aluminum pan, and add a little olive oil and your favorite fajita dry seasoning. Smoke in your SmokinTex with about 3 ounces of your favorite wood for 1 hour at 225 degrees. Remove and add meat and what olive oil is in the pan into a skillet. Add some thinly sliced jalapenos and minced garlic and possibly a bit more olive oil but only if needed. Brown meat and add onion and bell pepper. This is a great alternative way to use venison steak and, in my opinion, one of tastiest ways of making fajitas. My guests have ALL been thrilled with this dish. One warning thought: It's a good idea to make LOTS of fajitas, you will see it disappear quickly! Some folks will tell you that any wild boar weighing much over 80 pounds is not good table fare. I disagree, at least most of the time. I've used my SmokinTex on lots of boar weighing upwards of 125 pounds with excellent results. Next, I set my SmokinTex at 225, put about 6 ounces of wild plum wood in the wood box (dry wood only) and let the ribs smoke a couple hours. Luke uses his SmokinTex bbq electric smoker to smoke this ham from a wild hog he harvested. Want even more of Luke's hunting/fishing tips and tricks, wild game recipes etc?